Add this Chevy and you've got a winner. Chevrolet realized it needed a hatchback version of its popular Cruze in the US and it finally delivered. 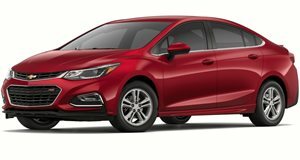 Revealed almost a year ago at Detroit, the 2017 Chevrolet Cruze hatchback is now on sale and, by all accounts, it’s a fine vehicle. We got to spend some time with a well-equipped LT trim model and there’s no question Chevy did a solid job here. Equipped with the $1,495 Sun and Sound and $1,150 Convenience Packages, our car featured a power sunroof, 8-inch color touchscreen, 9-speaker Bose audio system, and an 8-way power driver’s seat. Connectivity tech like Apple CarPlay and Android Auto capability, 4G LTE WiFi and OnStar all came as standard fare. Not bad at all for a car that carried a sticker price of $26,785. And, for the record, the Cruze hatchback is very much a worthy competitor against the likes of the Volkswagen Golf, Ford Focus hatch, and Mazda 3 hatch. However, we did have one issue that Chevrolet needs to address, the engine, of which only one is offered and it’s rather dull. A 1.6-liter turbocharged four-cylinder with 153 hp and 177 lb-ft of torque lies under the hood, with a six-speed automatic sending power to the front wheels. Aside from the optional 1.6-liter turbo diesel due for the 2018 Cruze, we really want to see the Cruze offer the turbocharged 2.0-liter that’s found in the likes of the Camaro, Malibu, Buick Regal, and Cadillac ATS. Imagine that engine powering a Cruze hot hatch with a six-speed manual. Chevrolet, are you listening? Special thanks to DGDG.com for letting us film the car.